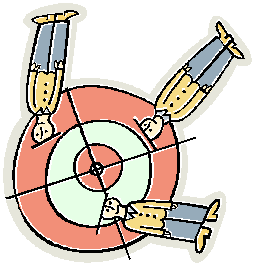 Inspired by a recent discussion in the B2B Lead Roundtable group on LinkedIn, I thought I would outline a few important steps for defining your target market. There is really *nothing* more important in marketing than having a good definition of your target market that everyone can agree with. If you do everything else right (i.e., you have the right message, the right offer, the right medium, the right timing, etc.) but you are talking to the wrong audience, then your marketing will almost certainly fail. So developing a good target market definition is well worth investing a little time and money. Meet with your head of sales and ask him/her who the target market is. Ask him/her for their description of “the perfect lead.” Tease out the difference between decision-makers and influencers since most B-to-B sales involve a decision-making *unit* (DMU) of more than one person. Also identify people who are often obstacles in the sales process who should NOT be brought into the DMU and should perhaps be filtered out of lead generation efforts. For example, I have learned that often the IT department is an obstacle (resistant to change) and they should not be brought into the discussion until the line of business managers are converted to internal champions. Note that you might have different targets depending on company size, vertical industry, and geography. Have the same conversation with your product manager that you had with your head of sales. The next step is to bring the head of sales and the product manager together in a meeting and reconcile the differences in the definitions they each gave you separately. It is actually quite common that the target market definitions from sales and product management will not be perfectly aligned, and you are bringing a valuable service to your organization by brokering this discussion and resolving the differences. You could also take the additional step of running some analysis of your existing customer base to quantify which titles and industries are most prevalent. As a team, prioritize the members of the DMU into primary targets and secondary targets. Prioritize the vertical industries and geographies. Now it’s time to get it down on paper. It’s important to make sure your target market definition is “actionable” — i.e., you need a target market definition that uses common terminology and categories that are used by media or list professionals. For example, use SIC or NAICS codes to identify key vertical industries. But I also recommend including some softer criteria that you or your media and list professionals can use to do open-ended searches. GEOGRAPHY: USA & Canada (or a list of states, postal codes/zip codes/SCFs, area codes, etc. if your selling territory is tightly constrained). Notice that the target market definition has both “hard” categorization (job titles, key industries, etc.) and “soft” categorization (job function). This gives you lots of important stuff to search for, and lots of categories upon which to evaluate one list source vs. another. Also note that I have included some things to *omit*. For example, I have omitted state and federal government organizations and aerospace & defense contractors — that’s because VARs are not allowed to sell to these industries since they are handled by PTC’s Direct sales force. Likewise I have limited the company size to $100 million or below — that’s because PTC’s VARs are charged with selling to small and midsized businesses. And if you are a VAR that sells in a limited geographic territory, be sure to specify that. No sense paying for leads you are not allowed to sell to. It’s important to note that you will never be able to find any list source or media that perfectly matches your target market definition. You will need to exercise good judgment to choose between multiple imperfect sources based on hard data and contextual data. Get both the head of sales and product management to sign off on the final target market definition. Alignment is critical. Now you are sharing accountability for the marketing/sales/product management activities that occur henceforth — they should all make sense in the context of the target market definition you have all endorsed. Now it’s time to take your target market definition and use it to put together an audience acquisition plan. I like to start by engaging a list broker (I have had excellent experience with Oceanos, http://www.oceanosinc.com). The list broker will deliver a report of postal/email/telemarketing lists that are available for reaching your target audience. Then, as you explore these list sources you will identify key publications, social media communities, websites, directories, trade shows, professional organizations, etc. You can also use your audience definition to engage a media planner to create a media plan (magazine, online, radio, TV, etc.). Or ask your list broker if they also offer these services. Stay tuned for my next blog posts, which will be a detailed look at list acquisition, including how to work with a list broker, the 3 major categories of lists, and the advantages and disadvantages of each category of list. This entry was posted in Audience Acquisition, Marketing Planning, Media Planning, Target Market, Vertical Marketing. Bookmark the permalink.